I love my Hydrangeas. I am not alone. Today a Master Gardener friend stopped by and fell in love with my Fuji Waterfall (Hydrangea macrophylla 'Fuji Waterfall'). 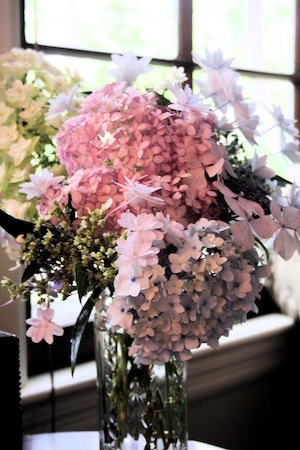 She said she had determined not to plant another hydrangea, not because she dislikes them but because she has so many. This one, she said, is the exception and she wants it! Then along came our mail person with a package delivered to our door and she wanted to know just what those beautiful shrubs were. She knew hydrangeas with the big ball flowers, but not the lace caps. She also is hooked! 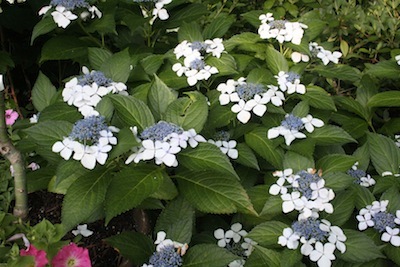 Lacecap hydrangeas can be just as showy in the landscape as the big mopheads (Hydrangea macrophyllas) we all know and love. Maybe even more so, since the mopheads are so heavy, they can droop. Bluebird (Hydrangea serrata 'Bluebird') is the showstopper hydrangea in this photo. It works very well in the front yard shade. The Fuji Waterfall takes awhile to gather and stiffen her branches. She will lollygag mostly on the ground for a couple of years before she matures and decides to billow out and up into layer upon layer of flowers. I love the Fuji Waterfall in the garden and in the vase. 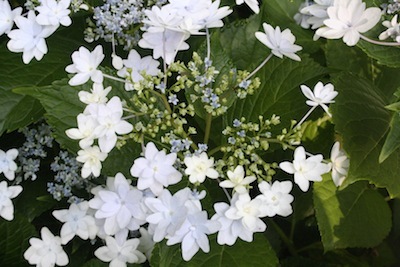 In a vase of mixed hydrangeas, her center of sterile flowers isn’t the show. It’s her starry flowers shooting out around the other flowers in the vase that catches everyone’s eye. Both of these hydrangeas will do well in light to medium shade. A little morning sun won’t hurt. They need to be kept watered when the summer dry season comes along. Feed them with a balanced fertilizer in early spring. Pruning hasn’t been necessary except to shorten a wayward stick-up once in awhile. They will both top out at about 3-5 feet and as wide. Fuji Waterfall is hardy in USDA Zones 6-9. Bluebird is blue in acidic soils and its hardiness zones are 5-9.